The traffic enforcement consists of all deputies providing the best traffic enforcement by statute. They are the primary law enforcement responders for 15 Townships in the county. There is only one full time police department in the county the rest of villages rely on the Harrison County Sheriff’s Office to handle call within their jurisdiction. They are empowered with the same authority as the Sheriff when they are sworn in. Thus, they have jurisdiction anywhere in Harrison County, including all villages and cities. The traffic enforcement section responds to numerous incidents including criminal complaints, civil complaints, deaths, missing persons, 911 hang up calls, alarms, animal complaints, house/business checks, motorist assist, traffic control, accidents public and private property, lost or recovered property and numerous other non-criminal related activities. If you would like to acknowledge outstanding service you received from one of our Deputies, or if you would like to file a complaint, please click on the link below to give us your information. Officer Complaint Form . Pictured Above: Deputy R.E. Toker conducting a routine traffic stop. Sheriff Ronald J Myers and Deputy Robert Toker announced the Ohio Department of Public Safety's (OPDS) Ohio Traffic Safety Office (OTSO) awarded $22,015.44 in federal traffic safety funding to the Harrison County Sheriff's Office for federal fiscal year 2011. "Partnerships are critical to the long-term success of any safety effort and we are committed to working with law enforcement and other local and state safety partners to address traffic concerns in Harrison County said Sheriff Myers." "These funds will help ensure that we can dedicate time and personnel to these efforts." 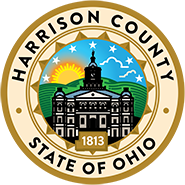 The Harrison County Sheriff's Office has identified several priority areas that will be targeted for increased enforcement of Ohio's traffic laws. To save lives and improve the quality of life for our citizens. The Harrison County Sheriff's Office will use the grant funds to increase patrols by deputies in these targeted areas. The funds are passed through OTSO from the National Highway Traffic Safety Administration to support the efforts of safety partners statewide and focus on traffic safety priority areas such as restraint use, impaired driving, motorcycle safety and youthful drivers. In the past three years, Ohio's fatalities have deceased to near record lows. There were 1,022 fatalities on Ohio's roads in 2009, down from 1,191 in 2008 and 1,257 in 2007. Sheriff Myers is working to continue that trend in Harrison County. For a Roadway Use Maintance Agreement applictaion for Harrison County Click Here . For a Special Hauling Permit for Harrison County Click Here . However you should contact the individual Township Trustees to obtian a copy thier Special Hauling Permits if you are traveling on any township roadways. For a Special Hauling Permit for the Village of Cadiz Click Here . For more information on the counties hauling permit or RUMA please feel free to contact the Harrison County Engineers Office at (740) 942-8867. You can also send inquiry by email to Doug Crabtree at hcengdc@frontier.com or Kris Miller at hcengkm@frontier.com.